When she woke up that morning, she found that it had snowed in the night and everything looked even more magical. She ate porridge with brown sugar for breakfast and then headed off to explore Hafnarfjörður. It was snowing quite heavily then and she was quite snow covered when she reached tourist information. She purchased a "Hidden Worlds" map there, which had locations marked where hidden folk, elves, light fairies and so on could be found. She peered under lava formations, looking for elves, and found icicles, prettily hanging there. She climbed across lava outside the swimming pool. She walked by the harbour and watched the waves splash on the rocks and then walked up the hill, to where capricious elf children were said to live. 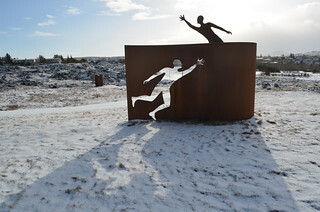 She headed into the snow covered sculpture park after that and looked at sculptures. 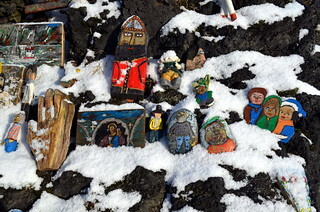 She wandered through the snow until she came to Hellisgerði Park, well known for its elves and hidden folk. She noticed fairy lights hanging from some of the trees, and other decorations and ornaments. She wandered through the park and met some fluffy cats (or were they elves? ), who she stroked. She looked suspiciously at the pond which had a pink scooter next to it. Had elves been playing on that? She found a playground with a slide and swings after that, and brushed the snow off, and started swinging then, amongst the snowflakes. 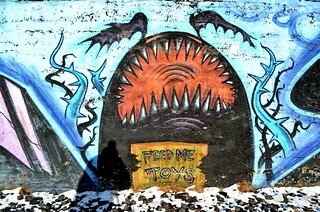 I especially like the "feed me toys" graf, and your cap of the light/dark sun/shadow sculpture.